Another Kijiji find…. I’m going to try driving Dressy this winter. The little paddock beside the house is sort of an L shape and wraps around the back of the house under my bedroom window. Twister and Nikita are in there at the moment. It’s the “fat pony” paddock for fat little horses who need to be on a strict diet. King ought to be in there with them, but there are political considerations that make it impossible (or in simpler terms… King tries to kill Twister). So sometimes, at night, I’m awakened by the clitter clatter of little hooves if the two little fat black ponies (generally known as the “Bobbsey Ponies) have a little burst of energy. It’s not uncommon, since they do tend to run out of hay before the night is over (being greedy ponies on a diet). Last night’s flurry of hoofbeats woke me up at around 2am. I muttered a bit and pulled a pillow over my head. But of course, this morning when I looked out the front door, there was Twister on the lawn. Sigh. I yelled upstairs to Jen’s apartment. “Jenny!!! Your little horse is loose!” She staggered out, bleary-eyed to catch him and repair whatever damage the little black wrecking ball had done this time. Turned out that he had lifted the new gate off the gate pins. He’s an ingenious little devil. He’s been here for ten years, and he continues to diversify his talents. He dismantles fences, opens latches, crawls under, rolls under, jumps over, and sometimes just totally demolishes any barrier. The only thing that will stop him is electric fencing. Which he tests daily. Anyway, as I was leaving for work, I checked on Jen’s progress. She was chaining the gate to the gate post. “Just like old times” I told her. “Yeah” she says “but this is the first time in about eight months that he’s escaped, so he’s improving!” I looked at her in great amusement “He’s been GONE all summer, Jen”. “Oh… that’s right” she says, looking deflated. He was away taking care of Reno, the orphan foal from April until last month. And yes, he managed to escape a few times when he was there too. Meanwhile. the GOOD pony, Nikita, was pacing back and forth inside the paddock fence. With the gate down. She couldn’t bring herself to step on the gate, or jump over it. That is what BAD ponies do. And Nikita would NEVER do such a thing. Since there is a bit of a shortage of shelter around here for the horses, I went poking around on Kijiji and found a second hand portable shelter for sale. With some help from Misha, her husband Tyler, and Jenny, it went up in a few hours. Diego and Zamaluck are in that paddock currently, and they do seem to be using it happily. Though Diego has been removing some of the duct tape we used to cover the ends of bolts for their protection. It’s 12 feet wide, and 32 feet long. I was a bit worried that it would be flimsy, but I’m fairly impressed by just how strong it actually seems to be. I’m sure that if a tornado hit it, it would fly away like a big parachute. But last week we had some pretty strong winds at around midnight one night, and I figured there was no point in sitting in my bed worrying about it. So I was out there in my jammies and rubber boots checking on it. Of course I don’t know what I would have done if it had actually picked up and tried to leave. Probably would have carried me away with it. For the last few months I’ve been treating a bit of thrush in Dressy’s front feet. She’s very prone to it, and has been since she came off the track. Her heels were horribly contracted when she arrived as a six year old. And although they’ve improved a great deal, they are still not what I’d like them to be. Here’s a photo of one foot on the day she arrived here, still in her racing shoes. So last night I decided to get serious about it. I trimmed her feet first, then took a hoof knife to her frogs. Trimmed away all the rough bits. And started poking around some. Sure enough, after prodding and prying a bit, I discovered quite a good sized little cavern in her right front. She was not happy about me poking into that sore spot. But I cut away the edges to open it up. Scrubbed it out as well as I could. Then mixed up some White Lightning and vinegar in a syringe. After soaking the frog in it first, I packed the whole thing with cotton wool, soaked it with more White Lightning/vinegar then wrapped it in vet wrap and duct tape to make a bootie. Did the same with the other foot (though I didn’t find any pockets in that foot). Put her in the stall for the night to let her feet fumigate. I took it all off this morning and had a look. It certainly bleached out the black stuff anyway. Looked and smelled a lot cleaner. I think it might take a couple of treatments though to be sure I’ve got it all. I put a bit of zinc ointment on the frogs before turning her out. She was quite full of herself and went out bucking. It looked like she was going to take somebody (me, or King, or Ares) out so I opened the gate and shooed her out onto the main pasture to work out her hissy fit there. She bucked and galloped and reared and spun in circles. Not to mention throwing a few kicks sideways in my general direction as she flew past. She’s a VERY important mare, and I interfered with her schedule by keeping her in a stall all night. King and Ares were excited too, but I think they spent more time getting out of her way than actually playing themselves. She’s quite impressive when she’s huffy. Just like last time, I passed Chrystal as she was trotting down Porter Road. Although unlike last time she was trotting down the road on Miss T, not Grace. I sort of laughed when I saw her and thought “I bet her knees are hurting”. Grace is an awesome little horse. But she does do a bit of careening when she gets excited. And sometimes after a long ride, Chrystal looks a bit battle-worn. So when she trotted into the parking lot as I was tacking up Dressy, I asked mildly “knees sore?” Chrystal laughed. Sure enough, she had gone out to tack up Grace and looked between her hot young firecracker mare and professional, reliable Miss T and changed her mind. Which is not to say that Miss T is slow, or quiet. But at least all she does is gallop off wildly in a straight line. Grace does a lot of lead-swapping flips back and forth across the trail as she tries to convince Chrystal that they could easily set a world record on the next few miles. Miss T is a small but mighty Morgan. I think she’s 17 this year? And has been doing 50s for quite a few years. She finished the Old Dominion 100 in 2008 (she was pulled at 90 miles the year before when she lost the padding from a shoe and came up a little sore). She broke a splint bone in the spring, but is completely recovered and sound. By then though, Chrystal had discovered just how truly fast Grace was, so never quite got back to riding Miss T. It was nice to see the little bay tyrant back on the trail. It was overcast, but warm enough to ride without a jacket. Well for me to ride without a jacket anyway. Dressy was not so impressed at being out at first. She’s been a little grumpy in general lately. I think I’m going to have to address some saddle fit issues with her. I’ve been riding her in King’s aussie saddle, but it’s really not right for her back and I’ve seen a bit of a change in her topline lately that I don’t like. We walked for a long time. Rides at the end of the season are nice. No pressure to get any particular distance or speed in. Just riding for the fun of it. Eventually Dressy decided that all this walking was boring and trotted out a little bit. Then she tried to get Miss T out in front, but she wanted Miss T to go FAST out in front. It was interesting to see her maneuvering to accomplish that. She’d drop back and then forge up a bit on Miss T’s shoulder to try to taunt her into competing a little bit. Two boss mares on trail are a very political mix. 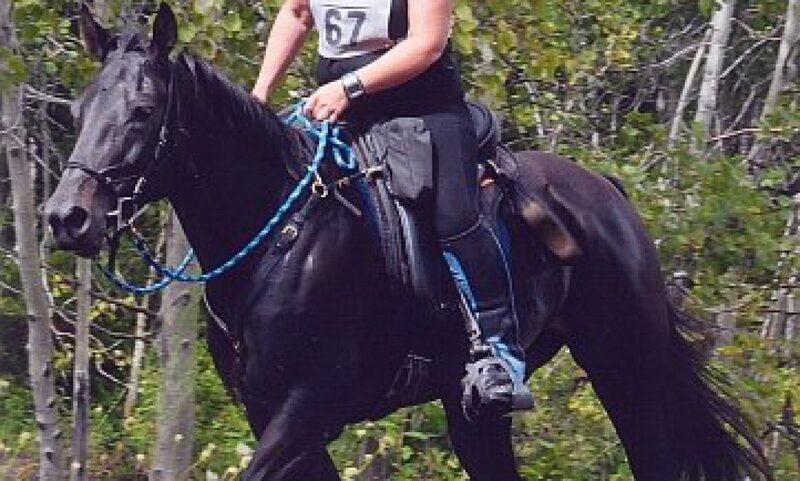 At one point, going up a hill, Dressy actually cantered. She tucked her nose, arched her neck, and did a beautiful, slow, three-beat canter! Okay, so it was only about five strides… but I take every little improvement as it comes. She got a great deal of praise for that one. After we turned back towards home, Miss T picked up speed and went into the front at a trot. Dressy trotted. Miss T broke to canter. Dressy took one stride of slow gallop and bolted. Flat out. Went past Miss T at a run. AAAAGGHHH!!!!! I cranked on her and finally managed to get her down to a hand gallop. Which still wasn’t slow but at least gave me the illusion of control. Sometimes I forget that she used to be a racehorse. I am thinking that it’s time to move along from the very soft myler snaffle I’ve been riding her in.